When Trulshik Rinpoche was 38 years old, he received from Kyabjé Dudjom Rinpoche the empowerments, reading transmissions and explanations of the whole Nyingma Kahma. He was also the sponsor for that important teaching. He also met Kyabjé Dilgo Khyentse Rinpoche for the first time. The first teaching he received from this great master, as a preliminary connection, was the commentary on Nagarjuna's Letter to a Friend. Khyentse Rinpoche then conferred on him his own profound rediscovered treasure cycle, the Nyakluk Phurba, and thereafter became his close teacher. Trulshik Rinpoche considered him his unique teacher of the definitive meaning, and as well as receiving teachings from him he transmitted to Khyentse Rinpoche some of the rare teachings of which he is himself the holder. The mutual teacher-disciple relationship they developed was an extraordinary one, the teachings passing from one to the other like the contents of one vase being poured into another. Trulshik Rinpoche received from Khyentse Rinpoche a huge range of teachings, including the complete Dam-ngak Dzö and other important collections. Indeed, Trulshik Rinpoche is now the holder of Khyentse Rinpoche's own collected teachings, and as one of his closest and most senior disciples was responsible for identifying and enthroning his reincarnation. 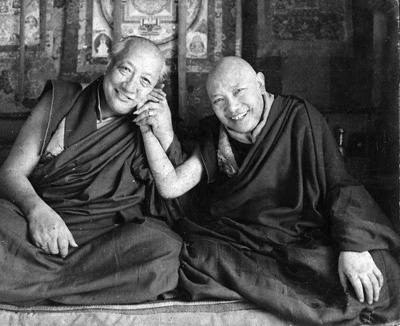 Over a number of years before leaving this world, Dilgo Khyentse Rinpoche had been transmitting to His Holiness the Dalai Lama a number of important teachings from the Nyingma tradition, including the principal texts of the Maha, Anu and Ati sections of the inner tantras. The honour of transmitting whatever remained of these teachings subsequently befell Trulshik Rinpoche, who has continued to offer empowerments and teachings to His Holiness, including the Druptap Dojö Bumzang compiled by Minling Terchen Rinpoche (who had transmitted the teachings of the Nyingma tradition to the Great Fifth Dalai Lama), and the major texts of Longchen Rabjampa such as the Ngalso Khorsum and the Seven Treasures. When Tibet was invaded in the 1950s, Trulshik Rinpoche left the country and established a monastery in the isolated Shar Khumbu region of Nepal, near Mount Everest, where he now has his principal seat as head of a large and flourishing community of monks, nuns and lay practitioners. He has continued to promote the preservation and spreading of the Buddhist teachings and practice, travelling widely in recent years to many countries all over the world, and is seen by many younger lamas of all traditions as a unique figure of reference, his vast learning, his integrity and authenticity, his disarming simplicty, and above all his deep experience and realisation, being unequalled in the present day. He was a flawless holder of the monastic lineage and ordained nearly 10,000 monks and nuns throughout his life. He also spend over 40 years in contemplative retreat. Trulshik Rinpoche's enlightened activity continued undiminished well into his eighties. In the last few years of his life, despite his gradually failing health, he was able to participate in Dilgo Khyentse Rinpoche's centenary celebrations at Shechen and spend time at Thubten Chöling monastery to guide the large community of monks, nuns and retreatants there. Finally, on 2 September, 2011, at the age of 87, he passed away peacefully at his new monastery above Sitapaila outside Kathmandu.